This pattern works best with a hook a size or two larger than you’d normally use. 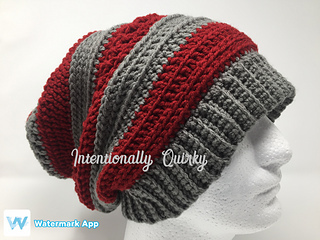 For the band, where I’d normally use an I, instead I used a J, and for the rest, I wanted it super squishy and relaxed so I went all the way up to an L. I’ve left plenty of room in this pattern to customize fit and style so this becomes your new FAVORITE Slouchy Hat. I know it’s mine, enjoy!